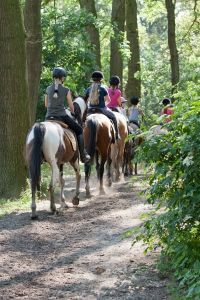 Exploring the Maasduinen National Park on horseback! 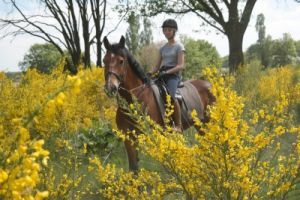 From FNRS Equestrian Centre Bergemo you have easy access to a large network of riding trails and carriage driving routes. Literary within minutes, you reach the Maasduinen National Park, which includes the stunning nature reserves of Het Quin, Het Broedersbosch and De Zevenboom. No matter what season, you are guaranteed to enjoy stunningly beautiful nature. Exploring the Maasduinen National Park you can encounter different grazers, e.g. cattle, sheep or Dutch land goats! Available at Bergemo: local maps for riders and carriage drivers. We offer hacks and treks for riders of all abilities. Our professional hack/trek leader will take you to all the best spots. We offer hacks and treks for riders of all abilities. The available options for group rides are listed below. You can also book a private hack/trek which suits your personal experience level. Hacks and treks for riders of all abilities! All hacks and treks are lead by qualified escorts. Prior to hacking/trekking out, we warm up the horses in the arena for 15 minutes. In this time we assess if the rider’s skills and abilities are sufficient for the planned ride. For novice riders our staff will groom and saddle the horses. Advanced riders can help groom and saddle the horses. This hack is suitable for intermediate riders. Walking and trotting through the woods, while exploring nature. If that sounds good to you, why not book? 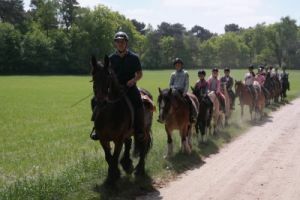 Suitable for intermediate riders from the age of 10, who have had weekly riding lessons for at least 2 years. This hack is ideal for advanced riders enjoying challenging rides. Walking, trotting and cantering you will explore the beautiful surrounding woodlands. This 1.5 hour hack requires advanced riding skills and experience as well as good endurance. Suitable for advanced riders from the age of 12, who have had weekly riding lessons for at least 4 years. - 90 minutes for advanced riders. For holidaymakers and day-trippers who want to ride more often the Bergemo Discount Card may be good value. If you have an FNRS Ruiterpaspoort, please bring it with you, so we can assess your level of experience at a glance. Also, we can register your hack/trek with us, and you will get a Bergemo stamp in your Ruiterpaspoort as a lasting memory.